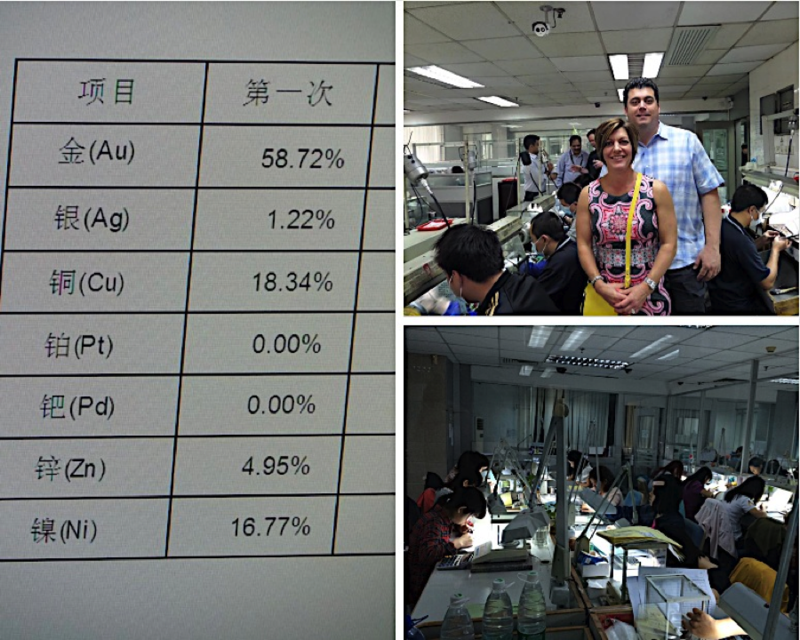 Next up, we’re off to Panyu, China, which has recently gained attention in the global gem and jewelry trade. An engaging factory visit, bustling with activity and cultural rituals, taught us about casting, setting, buffering, and designing jewelry. At first encounter, the factory was awe-inspiring: Three floors, uniformed workers situated at personal stations, and large machines with rotating functions. The top two floors manufactured jewelry for international vendors, and the bottom floor solely produced creations for the Chinese demographic. There was no difference in quality between the separated products – Chinese people have an affinity for smaller, more delicate jewelry – so just an altered design esthetic. If you’ve ever worn stones set in precious metal, this part of the tour will pique your interest. 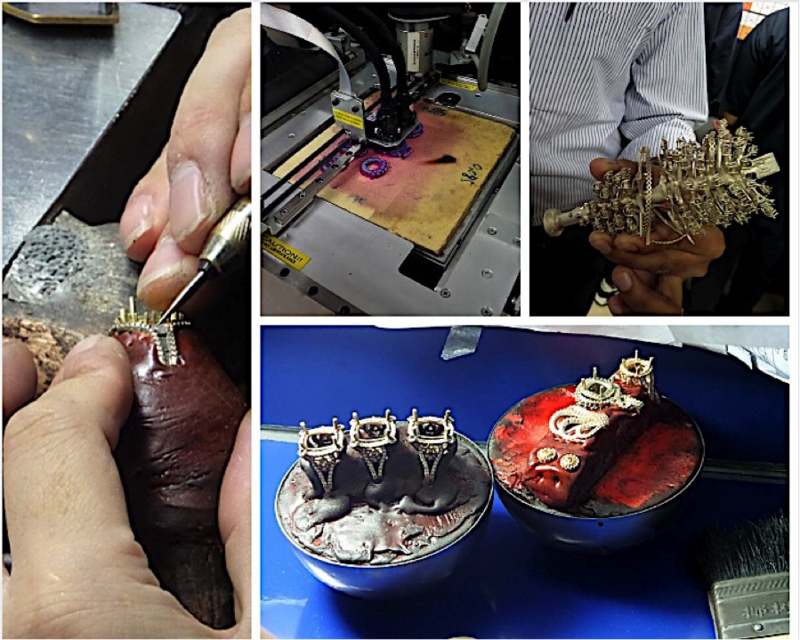 In the factory, a station where jewelry settings are cast has an unpredictable method: A printer-like machine adds layer upon thin layer of wax until the shape of the entire ring is formed. The wax is then encased in a plaster-like material. Finally, the wax is melted out and replaced with molten gold. We thought the process of lost wax casting jewelry was… magnificent. Hand carving is also another meticulous option for creating wax molds. The casted metals formed a tree of settings you could pluck separate designs from. Most are heads for rings but you can also spot earrings and a bangle. After this process, it was time for filing and finishing before stone setting. 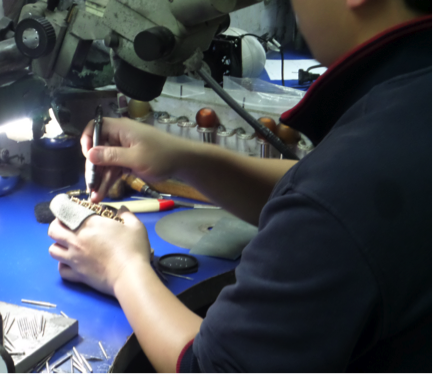 Several quality assurance (QA) systems are in place before a piece of jewelry is complete. Quality control is mandatory in each stage of manufacturing. For example, a sample from each cast “tree” is tested to determine the precise amount of each metal it contains – mostly to test for pure gold and nickel, due to common allergies. 14 karat gold jewelry should contain 58.5% pure gold, but they aim to top that number by about 1% more. Having the right amount of gold is not only required by law, but ensures the finished piece won’t have problems like pitting, flaking or porosity. Nickel needs to be at a level below 23% for health reasons. This factory is advanced in that they no longer use nickel in any of their jewelry. They kindly let me test my ring – which was manufactured elsewhere. You can see the results in the photo below: It passed! The best part about exploring QA was learning that no ring can make it to the final round (sales) with any sort of defect. After the samples pass this test, they are filed and assembled in preparation for stone setting. Each employee in this area the factory has a buffing station where they carefully polish and clean the gold. The workers were distinguishable; some were in uniform and some were not. When we inquired why, we learned the ones not in uniform were contractors hired to get ready for the two largest jewelry shows in the world: Baselworld in Switzerland and JCK in Las Vegas. 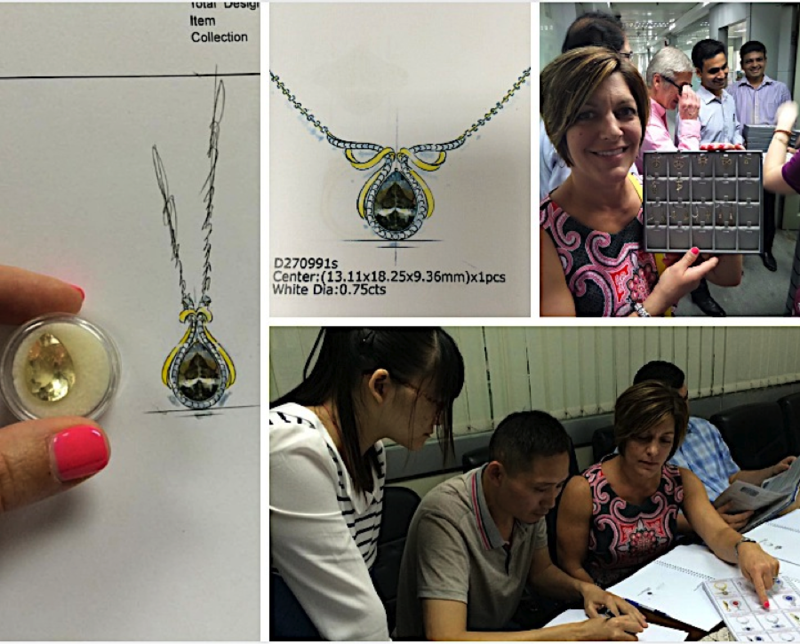 During our visit, they were preparing for JCK – a bit mind blowing seeing that the show is so close to home, revealing how much the jewelry industry brings the world together. At JCK they will showcase their most recent designs, as will everyone else in the industry. Of course, any time you travel, you’re tickled by the different ways in which people do everyday activities, but simultaneously, you take it all in as education. Pizza topped with corn and shrimp was eaten with gloves to keep your hands clean, which worked extremely well. And people took naps at their work station after lunch, which I can only imagine works extremely well too – a quick half-hour pick-me-up. And posting to social media wasn’t allowed; so sharing with you our journey now is quite special. Lastly, after our pizza lunch, we sat with a designer who was very skilled and very quick. He could alter and change our exact vision with pencil and paper in only minutes, even when having to speak through a translator. When we approved the drawing, they took it to get a 3D view so it could be made in-house. He reworked the design to fit a beautiful gemstone we bought in Thailand. He took into account all aspects that go into creating a piece of jewelry, including manufacturability, durability and aesthetics. 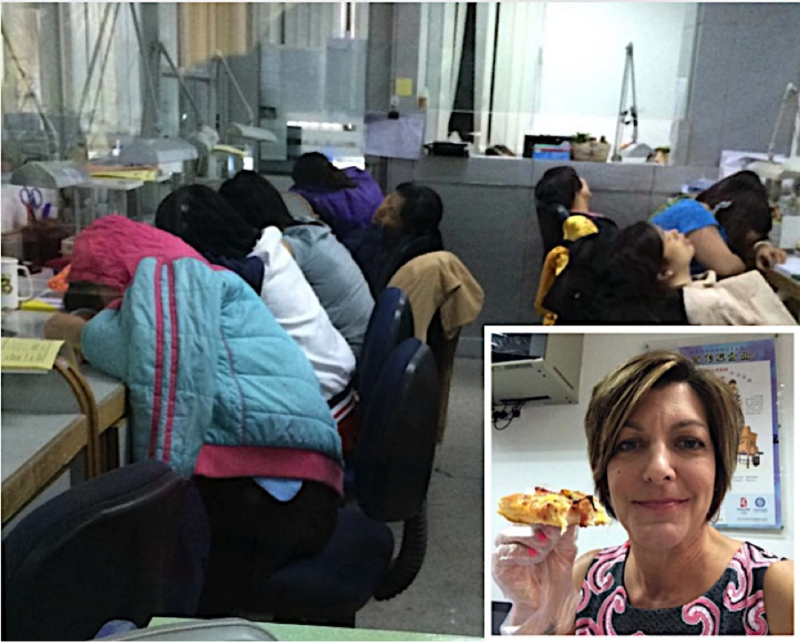 It’s clear to see why the gem market in China is burgeoning; they put forth much care in their craft and labor. You don’t need to have a keen eye for jewelry to enjoy their creations, you just need to have eyes. Beauty is a matter of opinion usually, but when it comes to gemstones, everything seems beautiful. Even better: We were able to take some home for you to buy. Also in China, we got exclusive access (set up by the vendor who curated our trip) to view the most beautiful pearls and opals we’ve ever seen. We saw such a wide and amazing array of these natural stones, we decided to give them their own chapter – Chapter 3. Keep a look out! For more on our Far East Gem Tour, get in on the conversation on Facebook and Twitter. We also have a pinned map on Pinterest. Read our blog about Thailand in Chapter 1 to get caught up. Thanks for being a part of this amazing journey with us –we hope you stay tuned for more.